Our Patron, Mollie Martineau, has died peacefully. She has been a great supporter of Martineau Gardens, since the beginning of our existence as a Community Garden. She loved how the Gardens reminded her of childhood nature walks. She visited whenever she was able, supporting our events and our fundraising. We benefited a lot from the affection and respect that Birmingham people felt for her. She kept up the connection with us, even after leaving Birmingham, sending warm messages to us through our Trustee, Glenys Thomas. We owe the name of the Gardens to Mollie Martineau’s family. It was Mollie’s father-in-law Wilfred Martineau, who, as Chairman of the Education Committee, established a Teachers’ Centre on Bristol Road after the war. 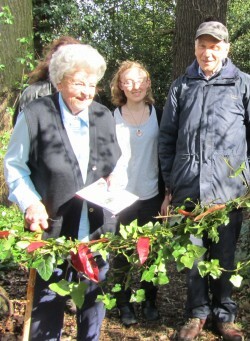 Pictured here, Mollie Martineau opening our Nature Trail (31 March 2011) – Mollie equipped with secateurs snipped through an evergreen, ‘living’ ribbon made from foliage of the Gardens.